Dr Justine Bell-James is a Senior Lecturer at the TC Beirne School of Law, teaching undergraduate and postgraduate courses in the areas of environmental law and property law. 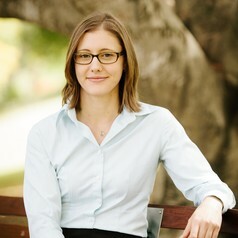 Dr Bell-James obtained a PhD from the Queensland University of Technology in 2010, and was subsequently awarded an ARC funded Postdoctoral Fellowship in 2011. Dr Bell-James undertook her postdoctoral research at the Global Change Institute at The University of Queensland, focussing on legal, policy and insurance responses to coastal hazards and sea-level rise. Dr Bell-James's research focuses on legal mechanisms for protection of the coast, drawing upon environmental, planning, property and tort law. In addition to her work on sea-level rise, Dr Bell-James is also particularly interested in novel legal mechanisms for protection of coastal ecosystems like mangroves and seagrass, protection of the Great Barrier Reef, and biodiversity offsets in the coastal context. Dr Bell-James currently holds an ARC Discovery Grant (2019-2021) to consider how ecosystem services provided by mangroves can be integrated into law.